So I was making the "flesh" version of Pixxus the other day, I dropped the figure into boiling water for a few seconds to loosen the joints and allow me to swap the parts easier. 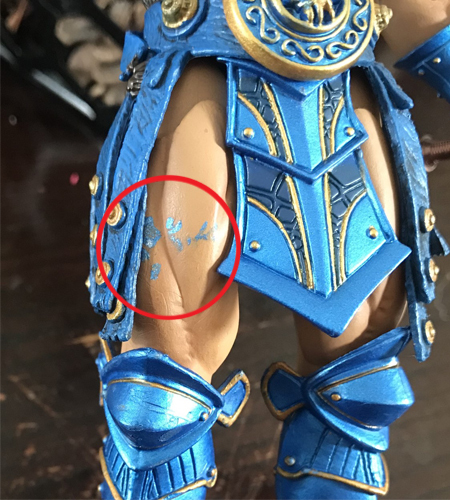 I didn't realize it at the time but some of the metallic blue paint came off the armor and got transferred to the "skin". I tried washing it off but its on there good, I want to remove it but not the flesh colored paint beneath, any suggestions? Try using a Mr. Clean Magic Eraser. You have to wet these erasers, don't try using it dry. Be gentle with it and don't bare down any more than you have to. Your goal it to just remove the blue rubbed on paint. Awesome thanks, sounds easy enough... I will give it a try! No problem. I use this method all the time. Just be sure not to scrub too much and take off the flesh colored paint. Because that can happen. Sooooo I tried this and it didn’t work, not sure why. I even scrubbed harder than I should have, maybe the metallic paint is stronger than the regular flat colors, who knows. Just saw the image tag in the original post. Missed it before because the coding was wrong. That's a bit more than just paint rub. How did this happen again? It wasn't there before you put the parts in water? You can try to scrape it off with a sharp exacto knife or similar hobby knife, but do it lightly and go slow. Don't apply any pressure to it other than the weight of the tool itself or you will scrape off the flesh colored paint. Other than repainting the thigh, that's all I got. There are other people that use chemicals to remove paint, but it could remove all the paint, flesh color included. Goof Off, Oops and a hand full of others are good to start will but you still have to be careful with them.